In this article, Kyle Newman appreciates Twitter for its users’ ability to distribute information and receive updates, and took advantage of it to promote to his film, which had a low marketing budget. He notes too that Twitter provides fans with a voice to which companies most likely listen. In this same article, Bonnie Burton, who tweets on the official Lucasfilm Star Wars Twitter account, discusses the ability to engage and connect with fans from around the world (Chow, 2010). Educators could learn a thing or two from Star Wars Twitterdom. “Exactly what?! ?”, you may ask incredulously, having the (understandable) assumption that Twitter is all about vacant narcissists blurting mindlessly and nonsensically about their breakfast or a current drunken escapade (the latter actually being potentially interesting, just as car accidents are to rubberneckers). Well, Mr. Newman and Ms. Burton do touch on elements that are or could be relevant to education, such as: all members of learning communities (parents, students, educators) exchanging key information, teacher-librarians effectively promoting libraries and services, and students engaging with their learning on whole new, and potentially global levels with what, despite initial impressions, is actually a very versatile tool with depth. I aim here to show you just how this all might be done. Ideally, I’d do so by tweeting this whole blog post in a 140 characters or less Twaiku (Twitter Haiku), but I’m just not that succinct. I’ve been using Twitter for probably close to a year now. Mostly that has involved only viewing others’ tweets, but I finally got up the nerve to start tweeting here and there, and my current profile status states that I’ve tweeted 113 times. I couldn’t much be bothered with Twitter before I found the handy Twitter organizational application TweetDeck, which provides me with separate columns to view those I follow, direct messages to me, tweets which cite my Twitter handle, and hashtags I follow. It also allows me to tweet from it and easily attach multimedia to my tweet. Actually, the downloading of Tweetdeck was an “aha!” moment for me. Everything became clear. That said, Twitter has just recently developed a new interface or view, which does compete to a limited point with what TweetDeck and similar applications can do. 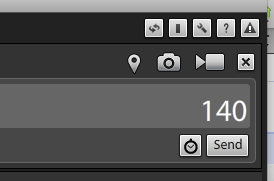 TweetDeck allows you to search and create columns for not only hashtags, but also for user names. If you don’t want to create a search column for a particular person, and just want a quick peek of what he or she has tweeted recently plus a profile, simply click on that person’s handle anywhere you see it in TweetDeck (in a tweet or under something they have tweeted), and a temporary column will pop-up. Load TweetDeck onto your Mac, PC, and smart phone: your columns and updates can be synchronized across these platforms. You can now include video and images to your tweets. Here is an example of where to do this in TweetDeck. You can chat about specific topics with others, including those who do not follow you, using hashtags. TweetChat and TweetGrid are useful (and better than TweetDeck) for fast-paced hashtag-based chats such as the twice-every-Tuesday #edchats. 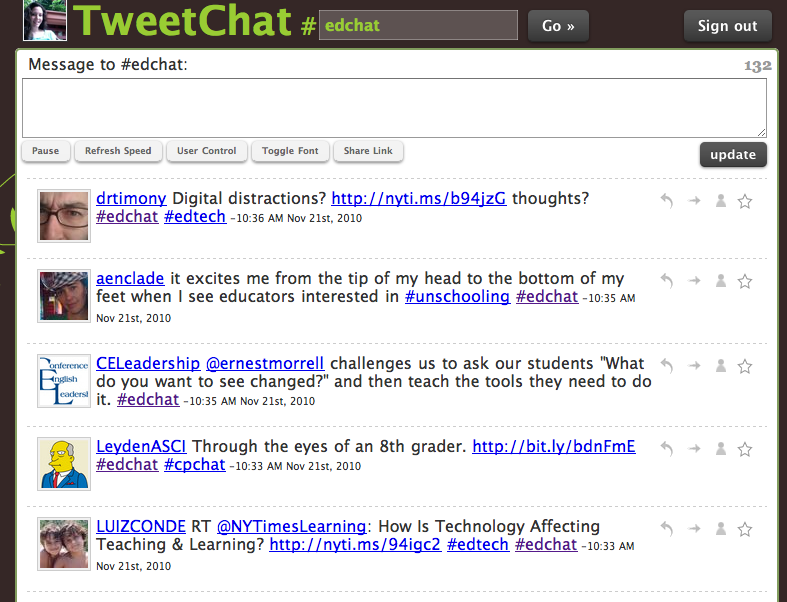 The bonus of these services is that a) they quickly scroll all relevant tweets (those with “#edchats” in the tweet), as they are posted (don’t worry, you’re not expected to read them all and if you do want to you can always read them later in the archive) and b) once you are signed in and have indicated which hashtag you are following, you don’t need to type the relevant hashtag in every time you tweet – these services do it for you automatically so that your tweets get to the right conversation. Note that you can vote on the topic for upcoming #edchat topics here. Indicate your favourite tweets for follow up later, which you can do right from e.g. TweetChat, which goes directly to your twitter account. 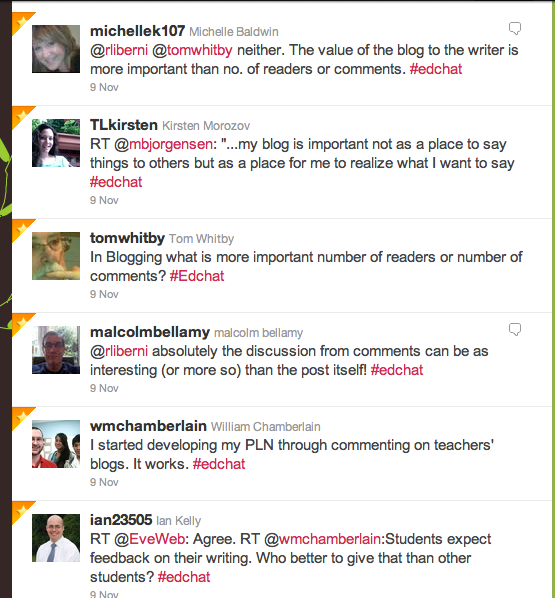 For instance, I “favourited” a bunch of thoughtful comments from a Tuesday #edchat regarding blogging for my upcoming blogging post assignment. Cybrary Man provides comprehensive information about various education hashtag-based chats here (and there is something to suit everyone in education, whatever your specialty). If there isn’t, then start one! Integrate RSS feeds of an individual’s tweets into your website or RSS reader. Note the RSS feed button on the bottom of the screenshot below in the old version of Twitter. In the new version, the RSS feed button (blue or red/orange, or a grey sign) is in the right-hand corner of the address bar on your browser, giving you the option to either follow that user’s tweets or favourites. I can’t seem to find the button in Chrome though, just Safari and Firefox. Integrate an RSS feed of a hashtag query or just a keyword query using Twitter Search http://search.twitter.com/ to awebsite or reader. I can add a website to my Twitter profile. Actually, I’ve known that I could do this for a while, but felt silly a bit silly about posting my blog here (which would essentially be advertising it). One thing I have noticed though is that if I am trying to determine whether or not I will follow someone on Twitter, I check out his or her web site. So, I just bit the bullet and added it. Note that while you can reply to numerous people, and mention numerous people using the @ before the user name, you cannot, as far as I can tell, direct message more than one person at a time. “View Threads: Threads are not easy to follow on Twitter, but the best option is to click “in reply to” under any tweet on the Web [that is in fact a reply] or in the new version of TweetDeck. That way you can see what the tweet was a response to and put it in its correct context” (Fuld, 2009). I also figured out that you can view a conversation in search.twitter.com. If there was a conversation, you simply click on the speech bubbles icon below the tweet, and it will expand to show the whole conversation. “Use Friendfeed: I never understood the whole Friendfeed craze but I recently discovered that it is a very good resource for searching for an old tweet. Twitter Search only goes back a few weeks, but Friendfeed [search] allows you to find any old tweet” (Fuld, 2009). A couple more sources of advanced Twitter tips and resources can be found here and here. Finally, it should be noted that Twitter can be an addictive, time-sucking black-hole, because, with the way educators use it, there are so many incredibly useful and interesting links posted. Following said links is addictive (and the links often go to blogs, where reading comments is an even more addictive and time-consuming activity). Note to self: MUST USE A TIMER! Other than my graduate degree course and the LM_NET listserv, I find Twitter to be my most used professional development tool. I don’t really use it for personal reasons, but I know of colleagues who do in an appropriate way. Twitter is commonly referred to as a virtual water cooler. Here are some ideas for using Twitter for one’s personal life and professional development. Increase your efficiency and download specific RSS feeds for a particular purpose. Build interest in and excitement for an in-service professional development session you are running, or for a larger conference elsewhere by creating a hashtag for the event (check to see that no one else is already using it for something else), start using it way ahead of time, and then have people use it as a backchat during the event (Hurt, 2009). Keep up with relevant education news. Connect with other educators on the other side of the world to develop collaboration activities for your students. For instance, a colleague of mine got out the word that I was looking for a class with which to collaborate (say, on a wiki) for the IB psychology option I’m teaching. Someone finally got back to me, through others retweeting. Unfortunately my students have chosen a different option now, so I can’t take advantage of this opportunity. Get suggestions and feedback for resources you need, ideas you have, etc. I have personally found the LM_NET listserv by far the best for this, with Twitter not as useful for me (in part because I don’t have a big following), although using a hashtag such as #tlchat (teacher-librarian chat) would expand who sees my query. Tweeple (Twitter users) will sometimes retweet your requests too, thereby getting your question out to a larger audience (i.e. those that follow the retweeter). The trick is to make your tweet shorter than the 140 character limit so that it can be retweeted with possibly additional hashtags and definitely your Twitter handle, allowing people to get back to you effectively by including your handle in their answer. Promote library events and new library resources, as well as fun ideas, as this library does here. Promote and share your own education experiences by tweeting when you e.g. have a new blog post. I could start using Twitter to inform our grade 11 and 12s of upcoming post-secondary information events (like representatives visiting our school) through tweets. I actually use an RSS feed of a Google calendar for this purpose, and don’t want to double my work, but this may be useful for last minute reminders, especially if I can integrate an RSS feed of a hashtag I create for this purpose onto a main school student page to which all students set as a homepage on their computers. Develop connections and community in your field or interest area. It becomes kind of fun when you start to see regulars. For personal purposes, use Twitter to connect with family and friends, keep up with hobbies and interests/issues through those you follow (through dedicated hashtags or perhaps on a separate account than what you use for your professional networking purposes), find roommates, get ideas for holidays/places to stay, ask for links to great recipes, etc. Twitter for Educators provides more information for teachers using or considering using Twitter. Get the best of #edchat through The #edchat Daily. 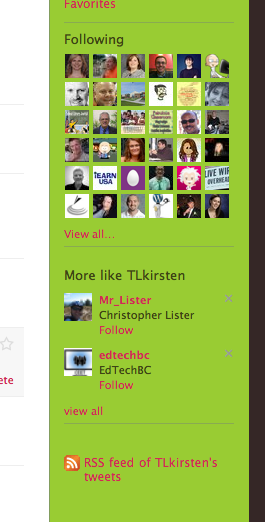 Twitter4Teachers wiki lists numerous educators on Twitter by specialty. Add this Google calendar of educational Twitter chats to your calendar. Find International Baccalaureate teachers using Twitter here. Here is a list of elementary teacher-librarians on Twitter. 100 Ways to Use Twitter in Your Library provides great tips and user accounts to follow. Richardson (2010) suggests using Edmodo as a free social network platform, with a Twitter-like application, for educational purposes. Edmodo can be found on Twitter too here. To improve safety with Twitter, consider creating a group on TweepML (tweepml.com), which allows users to “automatically follow each other by clicking a single link” (Demski, 2010). Have students protect their tweets so that only those approved may view them. I would also considering giving students access to RSS feeds of hashtags or tweeters you know to be trustworthy, although there are no guarantees. For instance, you could add a hashtag, keyword, or user handle RSS feed directly to a Google Site, using a gadget dedicated to this purpose, or RSS reader gadget, as I did on the Psychology 12 website I created. Demski (2010) includes a description of a French teacher’s students answering and asking questions in French on Twitter based on a literary text. Use Twitter to get kids to summarize topics and views into 140 characters – a challenging, but important skill. Get students to set up a Twitter account under a novel or story character alias and have them then write dialogues with each other, while staying in character, just as these Star Wars characters do on Twitter (warning: some of these conversations have questionable content). Have students write Twitter haikus or other micro-poems. Get survey results using twtpoll, getting people to e.g. give their top 3 recycling ideas in order to increase Environmental Literacy (Partnership for 21st Century Skills, 2009). Encourage shy students to tweet a question rather than ask it in person. Have students follow politicians, policy makers, scientists, artists, authors etc. and other relevant to their current unit of study, taking advantage of your own PLN, or this amazing service, which allows you to find the most-followed people based on a search for a keyword tag, such “psychology”, “biology”, “chemistry”, “languageteaching”, “drama”, etc. Note too that those actually involved in the Star Wars movies, like Carrie Fisher (aka Princess Leia) have Twitter accounts you can follow here. This is one way to increase Information Literacy skills and Civic Literacy (Partnership for 21st Century Skills, 2009). Have students tweet and maintain a certain “voice”, such as is done in the Hipster Star WarsTwitter feed (which is hilarious). Follow guides to books to encourage literacy, such as the Twitter guide to Star Wars books. Show students the Star Wars Uncut Twitter account, which will lead them to videos representing a global collaborative initiative to recreate the scenes of the original Star Wars movie in a variety of ways. This is truly the ultimate in Nerdliness, but just think how excited students might be to try something similar with a topic that is of equal interest to them. I connected this activity with the development of Creativity and Innovation skills (Partnership for 21st Century Skills, 2009). Promote school events such as an upcoming school play, and attach relevant video or images. How about having students collaboratively write a story, tweet by tweet? Kist (2010) describes just such a project that involved students from a number of different countries. You can find the final product here. Not only would this task have increased Global Awareness skills, but would have also encouraged the development of Communication and Collaboration skills (Partnership for 21st Century Skills, 2009). Here is a slideshare that provides some excellent ideas too, developed by a collaboration of Twitter users. Encourage students to follow author Twitter accounts, such as for these sci fi authors, here. Note that the likes of Meg Cabot (@megcabot) can also be found on Twitter. This can be done both to encourage engagement in literacy, as well as to improve writing, if the authors are willing to answer questions regarding this. Note that many classrooms tweet using a classroom account rather than individual student accounts, as is discussed in this School Library Journal article. Finally, here are some inspiring Twitter collaboration stories. Demski, J. (2010). Tweets for Teachers. T H E Journal, 37(2), 16-18. Retrieved from Professional Development Collection database. Richardson, Will (2010). Blogs, Wikis, Podcasts, and Other Powerful Web Tools for Classrooms. Thousand Oaks, CA: Corwin. You have packed so much into your post on twitter! It was great reading and learning – thanks! I am confident, youu have a huge readers’ base already! You realize thus significantly in relation to this topic, produced me in my view imagine it from numerous varied angles. your feed and sit up for in search of extra of your magnificent post.